The handset cradle attachment is designed to work with an HL10 on Polycom phones that sit up at a steep angle with nothing to support the bottom of the handset receiver. 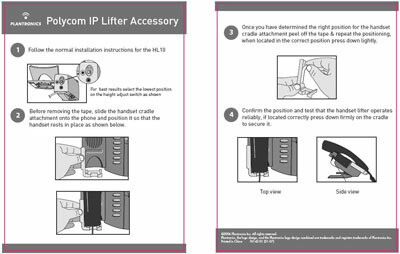 When the HL10 lifter is activated the handset receiver will slide off to the side and fall off of the lifter. We have found this cradle will also work on other phones with the same problem. Once installed the handset receiver now has something to rest against when the lifter is activated and will stay in place. Click here to view larger image of picture.